We present a prototype of an ambient assisted living (AAL) with multimodal user interaction. In our research, the AAL environment is one studio room of 60 + square meters that has several tables, chairs and a sink, as well as equipped with four stationary microphones and two omni-directional video cameras. 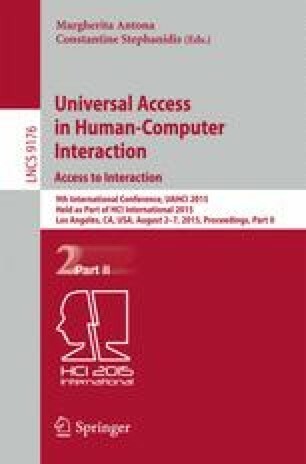 In this paper, we focus mainly on audio signal processing techniques for monitoring the assistive smart space and recognition of speech and non-speech acoustic events for automatic analysis of human’s activities and detection of possible emergency situations with the user (when an emergent help is needed). Acoustical modeling in our audio recognition system is based on single order Hidden Markov Models with Gaussian Mixture Models. The recognition vocabulary includes 12 non-speech acoustic events for different types of human activities plus 5 useful spoken commands (keywords), including a subset of alarm audio events. We have collected an audio-visual corpus containing about 1.3 h of audio data from 5 testers, who performed proposed test scenarios, and made the practical experiments with the system, results of which are reported in this paper. This research is partially supported by the Council for Grants of the President of Russia (Projects No. MD-3035.2015.8 and MK-5209.2015.8), by the Russian Foundation for Basic Research (Projects No. 15-07-04415 and 15-07-04322), and by the Government of the Russian Federation (Grant No. 074-U01).